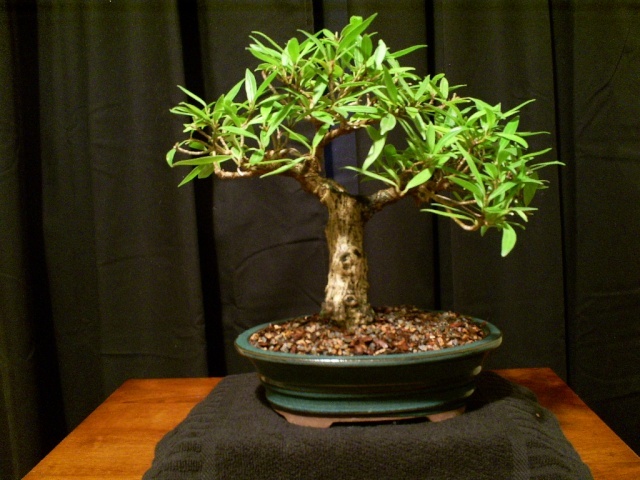 Just bought this ficus and although I'm happy with the tree itself, I'm not too crazy about the pot. Is it just me or does it seem way to small. I also think it would be better suited to a glazed pot rather than unglazed. Any pot suggestions or virts would be greatly appreciated. I am not a fan of glazed pots. 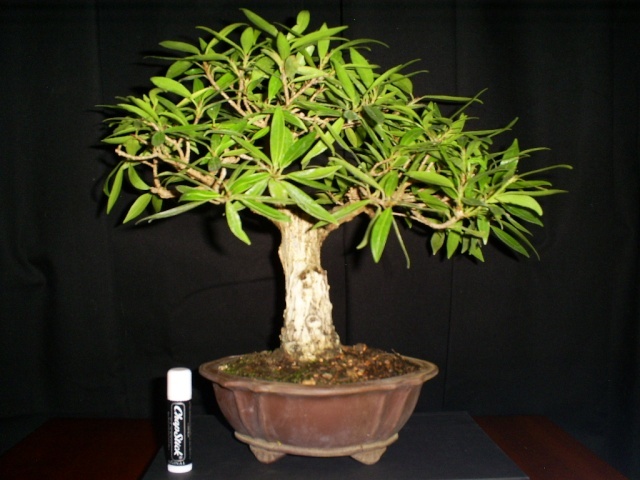 This Ficus needs a pot about 1/2 as deep and 2 to 3X as wide as the current pot. There are traditional rules about pots, not always followed but. Traditionally glazed pots are only used when the tree has color, either flowers or fall color in the leaves, then the pot glaze is chosen to match the flower/leaf color and the tree is only shown when it is displaying the color. An azalea should be in a pot where the glaze complements the color of the flowers. The depth of a pot should equal the width of the trunk at the soil line; with Ficus we sometime violate this rule by using an even shallower pot. Trees in training, poor health or trees that need more soil (Maples come to mind) also violate this rule. A tree with a trunk 2 inches in diameter at the base should be in a pot 2 inches deep. The pot should be 1/3 larger than the canopy of the tree. A tree with a canopy that is 8 inches wide should be in a pot 12 inches long. The tree should be planted off center in the pot, 1/3 of the distance on one side of the trunk and 2/3 of the distance on the other. The tree should be planted to the rear of the center line by the width of the trunk. The front base of the tree should be at the center line and the bulk of the trunk to the rear. The exception to this rule is a round or similar pot (such as this one) and then the tree is planted in the center. The front of the tree should either be centered over a foot, or as in the case of this tree, centered over the gap between two feet. The tree should be planted or styled to lean slightly toward the viewer. These rules are based upon fundamental artistic principles developed over the years and taking into consideration how the human eye and brain operate. I re-potted this ficus today into a new pot and gave it a bit of a haircut. I should have went a bit shallower, but I'll do that next time I re-pot. Hi Adam, It looks good, No need to change the pot. jun wrote: Hi Adam, It looks good, No need to change the pot.